Nearly nine feet long (2.7 meters) and as big as a grizzly bear, a huge catfish caught in northern Thailand may be the largest freshwater fish ever recorded. Caught last month (May 1) in the Mekong River, a team of fishermen struggled for more than an hour to haul the creature in. It tipped the scales at 646 pounds (293 kilograms). Despite efforts to keep the Mekong giant catfish alive, it died and was later eaten by villagers. The Mekong giant catfish (Pangasianodon gigas) species is listed as critically endangered by the World Conservation Union (IUCN), which means it faces a high risk of extinction in the wild. The rare specimen, captured in Chiang Khong district, is the largest since Thailand began keeping records in 1981. The giant catfish is currently the focus of a World Wildlife Fund and National Geographic Society project to identify and study the planet's biggest freshwater fish―those that grow to 220 pounds (100 kilograms) in weight or more than 6.5 feet (two meters) in length. "It's amazing to think that giants like this still swim in some of the world's rivers," said project leader Zeb Hogan, a National Geographic Society emerging explorer and a WWF conservation science fellow. "We believe this catfish is the current record-holder―an astonishing find," Hogan added. "I have heard of three-meter-plus [ten-foot] catfish in Bulgaria, 500-kilogram [1,100-kilogram] stingrays in Southeast Asia, and five-meter [16-foot] arapaima in the Amazon, but up until now we have not been able to confirm these reports." 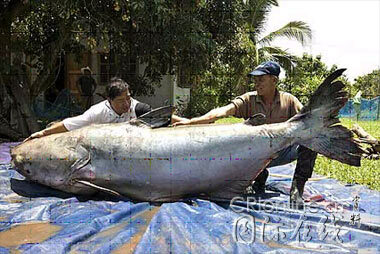 Other contenders for the title of world's largest freshwater fish include the Chinese paddlefish and dog-eating catfish―another Mekong giant. Hogan says such big species are poorly studied and in urgent need of protection. "In many locations they are now so rare that the opportunity for documentation and study may soon be lost," he said. Photographer Suthep Kritsanavarin witnessed the record catch on the Thai side of the Mekong, across the water from Laos. "I may never see anything like it again in my lifetime," he said. Kritsanavarin says only four other Mekong giant catfish were landed this year.